Google announced the addition of a submarine network family to its Japan-Guam-Australia (JGA) Cable System on Tuesday. 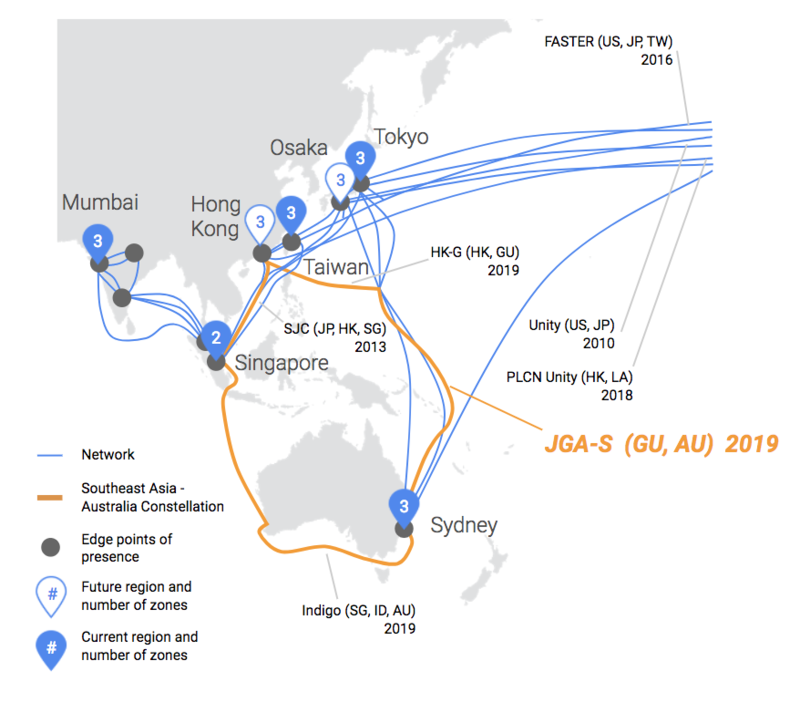 The addition, along with investments in subsea cables in the region, will improve connectivity to Google Cloud Platform's cloud regions across Asia and Australia. Microsoft Azure has also been beefing up cloud services in the region. On Monday, Microsoft announced that two new regions in Australia are available on Azure thanks to a partnership with Canberra Data Centres. Microsoft also opened up its Azure Availability Zones in select U.S. and Europe regions. The zones bolster resiliency for mission-critical workloads through fault-isolated locations with independent power, cooling and networking. In the slow but steady race to chip away at Amazon's market lead, Google and Microsoft are reaching as far around the globe as they can. Google's JGA investment comes as part of the investment plans the company announced in January, including the opening of five new regions this year and three submarine cables next year. Google's investment will form a "constellation of cables" between the Hong Kong, Singapore and Australia markets. As Google boosts its global footprint in the cloud market, it's still missing from China — a market Alibaba dominates but AWS and Azure are tapping, albeit in limited ways. On the one hand, the expansion of cloud providers around the world is a boon for consistency across a global network of digital businesses. But IaaS providers do have to contend with an a variety of regional and national laws and regulations in each new market they reach. To open new regions for government or critical infrastructure-related workloads, like Microsoft did in Australia, providers have to check off a long list of requirements for national governments. And in China, for example, Azure services are standalone from global Azure services, limiting availability in the market. In Europe, U.S.-based providers have to work around stricter privacy and data regulations. With GDPR just a few months away, compliance in Europe and around the world is a priority.